Last week I was tasting some Pinot Noir and I tweeted that I saw no reason for any Pinot to ever go over 15% alcohol. This was an unusually absolute stance for me, because I tend to be a relativist on the issue of alcohol. If a wine is balanced and doesn't taste hot, I won't mark it down solely on the numbers. And unlike some Californiaphobes, I will drink wines over 15% alcohol, particularly Zinfandel, which is notoriously high in sugar. However, not all grapes are equal. I'll try a Grenache with 15.5% alcohol, but I wouldn't consider drinking a Chardonnay at that level, and they exist. Here is my rough guide for what the alcohol range of different varietals should be. Generally, the highest number is there to accommodate ripe but balanced wines from California or Barossa Valley; the rest of the world really shouldn't be at the edge. Cabernet Sauvignon: About 12.5 to about 14.7%. Cab is the grape that makes me want to say "15 is too much." There are good wines higher than 14.5%; Shafer mysteriously makes all of its wines at 14.9% alcohol (taking advantage of the 1% tolerance in the law), and they're nice. But most Cabs over 14.7 are too big, too hot, and too uninteresting -- the grapes got so ripe that they lost their complexity. 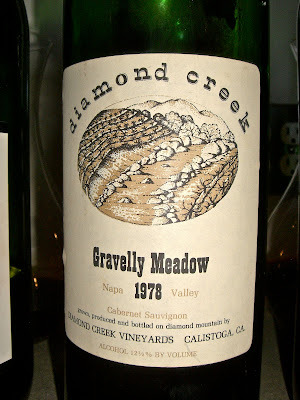 As for the low end, Kermit Lynch once showed me a bottle of Ridge Monte Bello Cab from the early '70s that was under 12%, and check out the 12.5 on the Diamond Creek bottle in the photo. That said, these days anything under 13 is really unusual and probably a manipulated corporate product. Merlot: About 13 to about 14.5. Merlot needs to be ripe, but should be soft and approachable. I might drink a glass of 14.9 Cab without food. I don't see why the world needs 14.9 Merlot. Pinot Noir: About 12.5 to about 14.4. The upper limit cuts off some Santa Lucia Highlands Pinots, but if I want a red wine that big I'll order Grenache. Making Pinot grapes into wine above 14.5% alcohol is putting a round wine into a square peg. Syrah: About 12.5 to about 15.5. The upper level is purely for Barossa Valley, but I have had some great Shirazes with balance at that level. However, if you want to taste the grape at its spicy, feral best, you need to get it at about 13.5 from the coolest climate you can. Grenache: This grape can handle some heat. I'll drink it from about 13 -- when it tends to be light and spicy -- to as high as 16, when it's ripe and full-bodied. Robert Parker has given huge scores to Grenache-based wines with higher alcohol than that, and I'll acknowledge that they taste good, but I'm driving. Seriously, if you want a good high-alcohol wine, look here. Zinfandel: Zin has its high-alcohol reputation not just because ripe wines can still be balanced, like Grenache, but because the clusters of grapes ripen unevenly, so that lower alcohol versions tend to be pretty bad. It's rare to have good, unmanipulated Zin below about 14% alcohol. However, I start losing interest above 15.5. Chardonnay: One of my gripes with many wine and food writers is the old saw that "wine is meant to serve with food." What if it's not? There's nothing inherently wrong with having wine as a cocktail, which many Americans do. That's the best use of Chardonnays over about 14.2% alcohol. I prefer Chardonnay from about 13.3 to 14% -- a pretty narrow range, because less than that is usually underripe or alcohol-reduced. But I'll drink it up to about 14.5%, though usually without food. Sauvignon Blanc: The whole point of this grape is to keep it lean and refreshing. I like it as low as 12.3%, and don't see any reason to drink Sauv Blanc over 14%. Riesling: Is there a grape with a lower limit or a wider range? I've had delightfully complex Rieslings at 7% from Germany and 14% from Australia. I don't think you'd want to switch countries with those numbers. Pinot Grigio: Lately in our rush to make everything bigger, I've seen Pinot Gris/Grigio with alcohol befitting a Cabernet. This is a mistake. Like Sauv Blanc, the point of this grape is to be refreshing, even the more complex Alsatian versions. I'll drink it as low as 12.5 but if it's 14, I don't want it. Viognier: You want a boozy white? Pick this one. It's naturally high in sugar and while I've had good ones as low as 13, it tends to peak in the 14s, and is the one white that I will drink all the way up to 15, though not higher. Rose: Why would I want a pink wine at 14.5% alcohol? It's not against the law to chill red wine. If that's what you want, drink that. Roses are best from about 11.5 to 13.5, and I'll rarely drink one above 14. Hey Blake are you a winemaker? What are your qualifications to make such distinctions? Nice post. Of course the dividing lines are seni-aribtrary (why 14.7% and not 14.5% of 14.9%), but there is absolutely a point at which a wine will lose typicity due to the alcohol level. I especially appreciate your comparison between Pinot and Grenache as I often feel very ripe, boozy Pinot is hard to distinguish from Grenache, though it sure costs a heck of a lot more. Grenache seems to handle the higher heat better than Pinot, for me. Isn't is a bit absurd to get this specific (14.2% ??) when the labeling laws allow a full percentage point in either direction above 14% abv, and a 1.5% spread below 14? You really have no idea what the exact number is, and if you think you can taste the difference between 14.8 and 15, you are crazy; there are so many factors that go into perception of alcohol other than the true percentage by volume. Anon 1: I have to be qualified to have an opinion? Haven't you ever watched Fox News? CFP: It was in tasting some really ripe Grenaches that I realized I didn't mind the heat as much, whereas with Pinot -- it's just no longer Pinot. Anon 2: Sure, the dividing points are arbitrary, but I have tried to err on the side of the highest alcohol I have seen on a label of a wine that I like. And I write down the alcohol percentage of thousands of wines that I taste each year, so I feel comfortable with those arbitrary limits. Yes, there could be a good wine with another 0.2% alcohol. But most likely it will be an overripe, characterless monster. We are beginning to bottle very very tasty 2008 RRV Zins under 14%. It wasn't easy to achieve, however it is possible. As you mentioned, zin is very difficult to grow and make as it ripens so unevenly, however, multi harvesting zin allows perfectly ripe (22.8 brix at crush) clusters to arrive at the crushpad with perfumes, rose pedals and the ever present layers of white and black peppers, in the 08 case, pepper powders. There's no real reason for really any wines to be above 14%, in fact I've banned them from my life all together and recommend to my clients to do the same. I won't make them and certainly won't drink the slop. If you are making sledgehammer Pinot or Zin, you either are going after a parker or WE or WS score or you were asleep behind the wheel in the vineyards and definitely at the crushpad. Raisins belong in your morning oatmeal, not at the crushpad. If you ask me, this overdone, cooked, pruny idea has gone beyond "a style" thing and is converging closely on an eneological crime. Randy: While I respect your opinion and might personally prefer to drink your wines, I'm not going to tell wineries *not* to go for a Parker score. Even within Parker-score wines, there are good ones and bad ones. He likes Chateau Rayas, for example. I have had too many good wines over 14% alcohol to draw a line in the sand there, although I know others have. It is true than some wines made from the west coast are sometime out of balance because too high in alcohol. I am sorry, but I don't get it. You write and talk about balance, but then focus entirely on alcohol. If you really believe in balance then you have to acknowledge that 14.4 alcohol may be out of balance at 3.8pH but perhaps not at 3.3ph. And this doesn't take into account TA, tannins, etc. Do focus entirely on one element is akin to being a tightrope walker and worrying entirely about falling off the rope to the left. Of course, the label point is a good one as well. Some of the wines (Pinots, as an example) you are finding over-ripe labeled at 14.5% alchol are probably actually 14.1% alcohol and some of them are probably actually 15.5% alcohol. I encourage you to drop me an email at adam@siduri.com and lets have the winery set up a blind tasting for both us of say 10 of our Pinots. Let's see how close we can come to putting them in the right alcohol order. You have to think about what a consumer can see. Total acidity, pH, etc., is not listed on the label; alcohol percentage is. Even with that said, I chose a range, not an exact figure, and that takes into account the other factors. Having an alcohol percentage inside the range doesn't mean that the wine will be balanced or delicious. What I am saying is that wines outside the range most likely will not be balanced, or varietally correct, or both. Great post. Arbitrary as your numbers may be, they're no more arbitrary than wine scores. Both are based on prior knowledge, a whole lot of tasting experience, and personal preference. Only one I'd quibble with is your lower range for Pinot. I've really enjoyed some simple cool-climate Pinot Noirs at 12 percent. It's a completely different experience than a 14-percenter. I don't agree....you don't have to just think about what the consumer can see. As a wine writer you have a responsibility to do more -- which is why you wrote an article in 2006 about the importance of acidity and explaining it to consumers. And it is also why you need to explain to consumers that what they see on the label with regard to alcohol levels is usually not accurate. The Diamond Creek bottle that you single-out at 12.5%? That's because labeling it that way gave it the leeway to go down to 11% and up to 14% without relabeling the wine. -- And the Shafer at 14.9% gives them the same (though 1%) leeway. That doesn't mean that those are accurate figures. It means that they don't want to pay the $$ to have the alcohol levels changed from vintage to vintage (the cost of re-registering the labels in the different states). And while you say you just provided a range you also said things like "I don't see why the world needs 14.9 Merlot" and "Making Pinot grapes into wine above 14.5% alcohol is putting a round wine into a square peg." That's more than providing a range. You've made me rethink my recent post on Dr. Vino's site about alcohol percentages. Though I prefer wines under 14%, you're right that all grapes cannot be painted with the same broad strokes in terms of how much alcohol they can handle and still taste decent. I'm not a big Zin drinker, but it is a grape I'd tread into 14.9% waters for...Grenache is my desert island wine, and I cannot say that I'd love any Gio above 14.5%, but I would be willing to try it. Best Gruners and Rieslings I've ever tasted were under 13%. Best Chards: 13.5% -- except HdV. I find your comments totally offensive. Not one of the 150+ wines I've made has ever been to garner points. Our wines are made to please one palate - mine. Two, I am most definitely not asleep in the vineyard nor at the crushpad. I spend a huge amount of time in vineyards each year, not just walking them but doing pruning, suckering, lateral removal, green dropping, etc. On the crushpad, I hand sort every single lot, over 100 tons total. Yet, our zins typically fall into the 15-16% range. Good for you for doing what you believe in. But that is no reason to denigrate others. CabFrancoPhile said "but there is absolutely a point at which a wine will lose typicity due to the alcohol level." The typicity you're talking about comes from volatile compounds in the skins. They are being released into the air as a factor of things such as time and temperature. They can also dissipate in the winery, such as during a warmer (high extraction) fermentation. So, while their loss tends to coincide with a rise in potential alcohol, that isn't the cause. With the right vineyard site, vineyard management and masterful winemaking - such as with wines from Carlisle and Big Basin - you can find varietally expressive, balanced wines with no heat at 16% alc. Pretty rare, though. Btw, It seemed pretty clear that Blake was generalizing. Mike, Not really looking to offend, rather tell the story not told very often. That is, the % of raisins coming to Zin producers' crushpads is offensive. Grower's getting screwed out of 20-30% weight (since grower's are still getting paid by the ton) is offensive, the amount of "hydration" involved when harvesting at 25 brix and higher is offensive as we know there's at least 2-4 points of sugar up on a 25 brix at harvest cluster is offensive. 27-30 brix post sugar up would equate to a 19% alc wine if the must wasn't watered back. So what's really happening here? It's the industry joke and we all know it. Just because one can reach high levels of shrivel (in October in CA) doesn't mean they should. Zin hasn't earn the respect it deserves because of the viscous, syrupy mouthfeel of these predominatly made (offensive) monster zins that coat the mouth not encouraging another sip. How well will the huge zins age before the 3.8 ph, 15.5% solution begins to brown. How do they pair with nightly dinner? Not wild boar or shortribs or steak, but NIGHTLY dinner? Right. Zins very quickly paint themselves into a California Cocktail scenero, which from a business perspective is not good. I'm going for drinkability rather than the full throttle style. I must be doing something right as my lighter bodied, lower alc, juicy perfumy zins are flying out the door. Again, raisins belong in oatmeal, not in wine. 1) Offensive? Who's offended other than you? In my mind, it is pretty simple, as a winemaker you make the wine you think best and people like it or they don't. But to call it "offensive" -- well, there's a lot of offensive things going on in the world, very few of them have anything to do with wine. 2) Raisins. We make Zin from just a couple of older vine vineyards in the Russian River, but we don't have an exceptional amount of raisisns, even if the brix is high. The two are not synonymous. If anything, we deal with pretty low pHs in our Russian River Zins which help keep skin integrity and don't lead to raisining. 3) I wasn't aware you knew how Mike or anyone else paid for their grapes. We pay many of our growers by the ton, not by the acre. But, fwiw, Zinfandel pricing in Sonoma County in 2009 was higher per ton than Merlot, Cabernet, Chardonnay, or Sauvignon Blanc (trailing Pinot Noir). This price was down 1% from 2008, but that was less of a drop-off than any of the other 5 varietals mentioned above. 4) I wasn't aware that Zinfandel didn't get the respect it deserved. I pour at ZAP every year and more people come to that tasting than come to any Pinot Noir tasting anywhere. 5) At what is recognized as a high conversion rate of .6, 27-30 brix doesn't give you 19% alcohol. Where did that number come from? I am happy to make wine and walk the vines, learn from the vineyard, make the wine, and do what I think makes the best wine. You’re interested in telling a story? Sounds like you’re more interested in marketing your wines at the expense of others. First, how do you know what the percentage of raisins is for other producers? Do you visit hundreds and hundreds of crushpads all harvest long, monitoring each lot for raisins? Secondly, why do you assume growers are getting screwed? How do you know they’re being paid by the ton and not by the acre? Funny, but in all the vineyards with which I work, I’m usually the first to pick, even before the growers pick for themselves for their own brands. I’ll have to let these growers know that they’re screwing themselves. I guess I’m screwing myself as well since I don’t pick my own vineyards until we’re in the potential 15% range. And even if the grower is being paid by the ton, they are also typically setting the price (at least in our case), knowing full well what the Brix requirements are. And to address a few other of your comments... 27 to 30 Brix yielding 19% alcohol? Have you discovered a new yeast that can perform distillation? And why do you assume zins at 15.5% have a pH of 3.8? We’ve had numerous zinfandels finish near 16% with pHs in the low 3.3s, and that’s with no acid added. There are plenty of French wines that historically have pHs above 3.8 and they seem to age just fine, even some with alcohols over 15%. And what's this about zinfandel not being respected? What other variety has had as large and successful organization (ZAP) completely dedicated to it? How many other varieties have had as many books written about it? Earned or not, to say zinfandel is not respected is bizarre. I’m glad your zinfandel is flying out the door but I find it interesting that according to your website, you are still selling 2005, 2006, and 2007 zinfandels. I find it even more intriguing that your ’05 was picked at 25.8 Brix at harvest and the alcohol is listed as 14.7%. Either you watered back significantly to hit 14.7% and/or the alcohol is more like 15.5%. As you said, if Brix are 25 at harvest, add at least a 2-4 point soak on top of that. And curiously, you say your ’07 was picked at 23.8, a full two Brix lower, but it too has an alcohol of 14.7%. I'm sorry you’ve had to ban your own wines from your life. A real shame. The market is big enough and consumers’ tastes are varied enough to support multiple styles of zinfandel. I say bravo to that. Celebrate the diversity. As long as consumers purchase it, there is no right or wrong style. Gee, I must be farming in a different universe than you guys. I'm finding that at even 22.8 brix, I have at least .75 brix sugar up. When i made bigger higher alc wines harvesting in the 25-27 range at crush, there was at least 3-4 points of sugar up that seems to go unaccounted for. No one really brings it up... that is the amount of gallons of h20 dumped into the crusher... for what reason? Either the super shriveled clusters are being removed, either there's 12-20% water back happening or the 15.5% on label is really in the 16.5-17% range in solution. I'm not specifically singling out Mike or anyone else. That wasn't the point of my rant. .62 is the most accurate conversion rate for zin. Having made RRV Zin now for nearly a decade, .62 is almost to the exact final alc once ALL of the sugar is soaked up. This is why Zin is so challenging to make in a juicy, balanced, lower alc state. This is a fact Adam, you may not choose to acknowledge it, but use .62 on the upcoming Papara Zin and you'll see what I mean. Folks harvesting high sugar zin (and other varietals)are inflating the price per ton because grower's know this and want more because of this trend. Adam, ZAP has become a joke. Pouring next to guys with twirling hats and mini microphones as they heckle and shout at passer byers, the pride of breaking stemware, the obscenity of high alc, overly oaked and brett laced sauce that are poured there. The outward, public drunkenness is not what I envision for Zin. Nah, not for me and my wines anymore. ZAP folk pride themselves on the in-your-face styles that are poured there. This is not the way to bring zin into the legit limelight of noble varieties. Zin deserves better. Not using this bg as marketing either. The people reading this are fellow winefolk, not DTC or DTT consumers. I'm attempting to open dialogue with my colleagues about the dismal state of Zin. The big style has at best a very limited section of wine drinkers and that's unfortunate. From a pure business stance, it's bad business. Why hasn't zin broken the $50 mark when there's a ton of crappy Cab and Pinot out there beginning at that price point and moving up quickly? Mike, I have a very good control over my inventory. My goal is NOT to sell out. Hold back cases, that wine will become better integrated with time, fewer number of cases remaining, higher price per btl. Econ 101. Moreover, I have the liberty of pulling the cork on a vaulted wine on a given Friday Afternoon to showcase age ability, etc. In the past, I'm guilty also of hydration, but with multi-harvesting, I've been able to get the desired results with much lower sugar. At least I'm honest here and in the TR about what's really going on with Zin and am proactively changing. Adam, you are telling me that you do not notice much sugar up at zin harvested in the 25-27 range? Are you really telling us this? Zin and syrah as I've mentioned can still be balanced above the 14%range. I was specifically talking about whites, Pinot Noir and Cab's. Glad that we can discuss wine topics with passion. It’s good for Zin and its future. I'm the everyday person who likes to meet friends, have a glass of lovely, and be able to drive home. A 13% wine, or less, allows that. It means little to most people if the wine is balanced, if there is Deep Purple, biodynamic, has great structure...we want to meet and talk and be together and enjoy. Nowadays two glasses of wine is like drinking two single malts. I want a wine that is enjoyable with tapas and conversation and is amenable with watching the road and steering the car. Winrmakers, give us a break...I cannot spend my life drinking the nectar of the gods...Mosel Riesling. Thanks for your post. I think it's a good analysis, and one with which I agree, for the most part. I would add that the temperature at which a wine is served is very important, and it makes a huge difference in how the wine is perceived, both in the nose and on the tongue. Quit making stuff up! Why make weak wine? Anything below 15% is a complete failure. Any real wine afficionado can tell you that each wine is different and each region is able to create wines that are unique regardless of alcohol %. Just because Southern Wine and Spirits doesn't force it on you in your local market doesn't mean it doesn't exist or isn't great. Try Gigondas! Gee, a Rhone Grenache at 15% + that is absolutely at the top of the heap? Hmm. Get over the numbers and into the flavors and the FRUIT. But you'll never enjoy these wines unless you are connected with corect regions. There is simply not enough production of the truly good stuff that isn't mechanically manipulated and the appreciative locals drink it all with a deafening lack of complaints. PS - If wines aren't masked with new or faux oak, they can carry higher alcohol without being "hot". Funny how the most expensive Cabs & Bordeaux's are well into the 14+% range! The truth is the average person guzzling wine these days can't tell the difference between many varieties let alone the alcohol content. Just look at the "wine" that Trader Joe's sells and people scoff up by the case. Ask your average wine drinker in this country if they can detect apricot, cherry, plum, blackberry, grass, flint or any other flavor in the wine they're drinking and they'll look at you like you have two heads. I know people who leave an uncorked bottle of wine on their kitchen counter for days and see no difference in flavor from day to day. The wine connoisseurs who try to impress people with technical terms, flavor nuances, aroma characteristics and other subtleties are impressing no one and certainly not peaking the interest or attention of the vast majority of wine drinkers in this country. What happens to Napa if Cabernet falls? Should price count in a wine competition?